Trauma is a pervasive and complex aspect of the lives of Aboriginal and Torres Strait Islander people, and, inevitably, a part of any conversation about mental health. It operates at an individual, collective and community level, and has historical and contemporary manifestations. 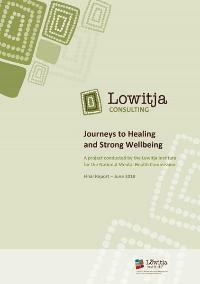 The Lowitja Institute was commissioned by the National Mental Health Commission to conduct research in Aboriginal and Torres Strait Islander mental health. The overall purpose of the project was to identify areas of focus and action that support good mental health among Aboriginal and Torres Strait Islander people on their own terms. Our findings and recommendations are based on advice and guidance from an expert reference group, focus groups and interviews held in Brisbane, Melbourne and Broome, and a workshop with Aboriginal and Torres Strait Islander stakeholders held in Canberra. The work highlights the need for healing at the individual and community level. Having well-resourced and culturally safe mental health services, and healing measures – the ‘best of both worlds’ approach – are vital pathways to healing. Healing as a nation is a political process that will require commitment, listening and leadership on the part of our elected representatives. A roundtable report is also available.